“It’s not easy being green,” Kermit the Frog famously lamented. And it’s true: green flowers go against our intuition. We simply don’t expect flowers to be green. We’re accustomed to verdant landscapes of leaves and needles on trees and shrubs, of lush green ground covers and leafy perennials. But green flowers? Not so much. Flowers typically add drama in shades of red, blue or purple, even yellow or white. Green flowers catch us off guard. Lately however, the shock of green flowers has softened for some people. There’s growing appreciation for the excitement and entertainment value that green flowers bring to bear. Green flowers offer designers and gardeners a bold, new look. In a mixed floral bouquet, a single green spider mum brightens all the other flower colors, while a cluster of chartreuse button mums lends a splash of panache. One mum was even named after the Muppet (Green Kermit Chrysanthemum), proving that green can indeed be great. Bill Calkins, product marketing manager for Ball Seed Company, sees great potential for such green flowers. “A green flower on a green stem with green foliage creates a fantastic monochromatic look, a popular design trend in home décor,” he said. In the garden, “green or chartreuse-colored plants can be a great way to lighten up the shade, as they capture dappled sunlight and give off their own illumination,” Calkins said. In color theory, green is directly related to nature, so it is often used to promote environmentally-friendly products. Dark green is commonly associated with money. Grace Dinsdale, owner of Blooming Nursery in Cornelius, Oregon, agreed. “People love the new green flowers,” said Dinsdale, whose wholesale nursery has grown perennials and annuals for 34 years. Jennifer Williams, a merchandizer at Dennis’ 7 Dees Garden Centers in the Portland metro area, is a big fan of green flowers too. As the calendar turns throughout the year, perennials, annuals and shrubs offer all sorts of options for accenting with green flowers. In the gray days of late winter, many varieties of Helleborus produce nodding flowers that cheer up the shady corners of the garden. 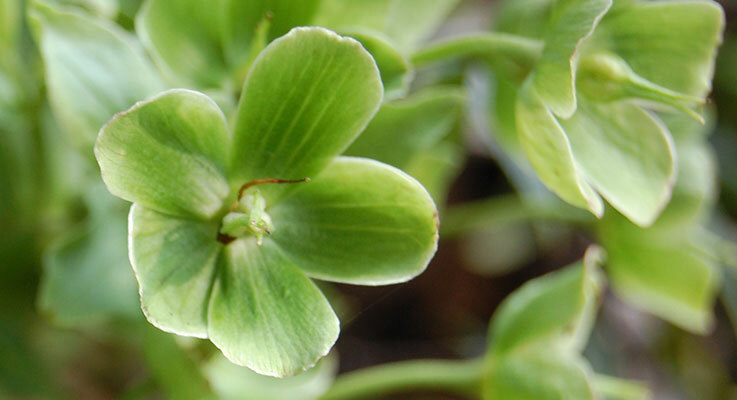 Some hellebores produce completely green flowers, like H. foetidus, H. argutifolius ‘Silver Lace’ and the H. × sternii ‘Blackthorn’ strain, while others boast green accents. H. lividus cultivars such as ‘Pink Marble’, for instance, develop creamy green flowers with a pink blush that mature to sage green. Dinsdale recommended the merits of ‘Green Lace’ primula for the early spring garden. Flowers start early and stay attractive for a long period of time. Even when the green petals drop, Dinsdale said, the show goes on, since the bracts are green too. When rhododendrons and other spring flowers start to strut their stuff, late-flowering green tulip flowers continue to astonish the unsuspecting observer. And in summer, all sorts of vivid green flowers can provide counterpoint to the riots of hot-colored flowers that spill from baskets and beds. Dinsdale likes plants with great growth habits such as Echinacea ‘Green Jewel’ with its wonderful sturdy habit and brilliant flowers. Williams recommended ‘Green Jewel’ too: besides having light green ray petals around a large green cone, this beauty is fragrant. The combination of purple and lime green in Echinacea ‘Green Envy’ produces a “dramatic, splashy effect that really pops,” according to Dinsdale. ‘Lanai Lime Green’, a very popular verbena grown by Blooming, blends well with and softens strong pink, purple and blue flowers. Alchemilla mollis, commonly known as lady’s mantle, softens everything with its green flowers, and modestly self-seeds around the garden. A. alpina, an evergreen ground cover that is about a third the size of A. mollis, sports delicate silver-edged leaves and the familiar green flowers. Nicotiana langsdorffii produces exotic, drooping sprays of apple green bells on stems up to 5 feet tall, Dinsdale said. A smaller version with an old-fashioned look, N. alata ‘Lime Green’, stays under 3 feet. Williams likes Zinnia ‘Envy’, which produces the best chartreuse coloration in part shade to full sun. Rudbeckia ‘Green Wizard’ also appeals to Williams. Without a ring of petals, the dark cone and long, thin green sepals are the stars of this striking flower. Kniphofia ‘Percy’s Pride’ earns high marks for being “striking, fabulous and robust,” Dinsdale said. Breeders have piqued the interest of petunia lovers by adding lively chartreuse edges to a number of bright pink or purple flowers such as Pretty Much Picasso® and Moonlight Eclipse®. When it comes to shrubs, Williams picks Viburnum ‘Snowball’ as a good option for green flowers: blooms, which start as a luscious green early in the season, mature to white and make a wonderful cut flower. When the heat of summer makes other flowers fade and sag, the huge, elegant, celadon green flowers of Hydrangea paniculata ‘Limelight’ and its smaller self ‘Little Lime’ manage a fresh, clean glow despite the heat. Williams also likes the versatility of Hydrangea arborescens ‘Annabelle’, with flowers that are green early and late in the season, when the day length is shorter. Green lacecap flowers make a beautiful bouquet. ‘Pistachio’ (Hydrangea macrophylla ‘Horwack’) creates a sensation with mophead blooms and petals of dazzling lime green accented with rich, deep pink and purple eyes. The transition from florist flower to garden plant is not always an easy one, though, Dinsdale said. Take Dianthus ‘Green Ball’, for example. Its one-of-a kind, vibrant green, globe-shaped, highly textured flowers stand out. Uses for it and other green flower cultivars are only limited by imagination and the willingness to try something new. Availability, however, can be an issue. At Dennis’ 7 Dees Garden Centers last year, Jennifer Williams included ‘Green Ball’ in her recipe for mixed annual hayrack gardens that decorated fences at each site, and customers were delighted by the unusual splashes of green in the displays. ‘Green Ball’ put on a great, long-lasting show, blooming continuously from May through September and functioning as “filler” and “spiller” in the hayrack gardens, the long-stemmed blooms winding their way among other foliage and flower plants. The color inserted a distinctive “thriller” into the compositions, too. If growers aren’t tuned into the interest and demand for green flowers with retail shoppers, such flowers won’t reach the market. What happens is that some plants don’t lend themselves to being good options for the retail market, Dinsdale explained. Shoppers want plants to be in bloom when they buy them, but some plants have growth habits that don’t stay looking good in flats of small plants, even if they make great additions once they get to the garden. If plants are already known, people may be willing to buy them out of bloom, Dinsdale said, but when a flower is new and its growth gets rangy in the pot, they don’t sell. These factors make the difference between whether or not growers opt to invest in growing them for the gardening public. Still, for all Kermit’s lamenting about the difficulties of being green, the verdurous flowers of the plant world are rising to the challenge and showing some real gumption.